Mujahid Yusof Rawa, the minister in charge of religious affairs, has carefully cultivated an image of himself as an open-minded political moderate and reformer, someone who stands apart from the rest of the extremist crowd. Of late, however, his pronouncements and actions have led many to wonder just how deep his commitment to reform and moderation is. His reaction to the recent International Women’s Day rally is a case in point. While he had nothing much to say about many of the legitimate issues concerning women’s rights that were raised, he expressed himself shocked over the presence of members of the LGBT community who were also there to press for their rights. Admittedly, the LGBT issue is controversial in Malaysia but to suggest, as Mujahid did, that they were “abusing the democratic space” was simply outrageous. Clearly, he does not understand that in a democracy everyone, including the LGBT community, has a right to be heard. And now we have the police investigating the organizers of the rally under the sedition act. Harassing women fighting for their rights is common enough in a Salafi state like Saudi Arabia; that it should happen in a secular democracy like Malaysia is cause for concern. In the short span of a few months, Mujahid’s journey as a minister in Malaysia Baru has taken him from standing alongside a transgender activist and pleading with the public not to discriminate against the LGBT community to open hostility against them. He has gone from championing human rights to calling for greater restrictions on our democratic space. And he has shifted from insisting that Jakim and other Islamic agencies should be reformed to empowering them yet further. Indeed, he is now defending Jakim’s excessive RM810 million budget as reasonable and justified. Instead of moderating the worst excesses of agencies like Jakim, which he said was one of his priorities, he is allowing them to slowly radicalize his political views. How Mujahid can bestow his admiration on the same man who, convinced that UMNO would win re-election, argued that it is better for Muslims to support a corrupt Islamic regime (UMNO) than an honest one that includes non-Muslims (PH) is also inexplicable. Of course, as soon as UMNO lost power, Zakir shamelessly rushed over to kiss Dr Mahathir’s hand and ingratiate himself with the new government. His confidence in the absolute gullibility of Malaysia’s ruling elites was clearly not misplaced. Heroes, it seems, come quite cheaply in Malaysia. Mujahid has since tried to justify his meeting as an attempt to educate Zakir about the country’s Islamic administration. Few will be fooled by such a facile explanation. 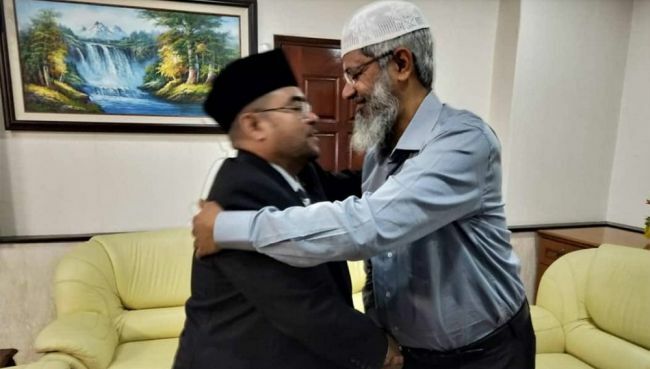 Now that Mujahid has anointed Zakir as worthy role model, in effect Malaysia Baru’s new inspirer-in-chief, every ceramah door in the country will be open to him and his extremist teachings. Don’t be surprised if Zakir soon emerges as the most influential Islamic voice in the nation; quite a coup for a fugitive but what a setback for national unity! But let’s face it: when it comes to Islamic radicals, the ruling elites seem to have tunnel vision. Even the police seem to go out of their way to avoid confronting the ugly reality that Malaysia is far too tolerant of extremism. In explaining the increasing number of terrorists who use Malaysia as a base, for example, the IGP suggested that it was due to the fact that Malaysia has good air links with the rest of the world, as if somehow Malaysia is the only well-connected country in the region. The fact is terrorists choose Malaysia as their base of operations because they know that the religious culture here is more accommodating and supportive; extremists only have to don the right religious garb and speak the same Ketuanan Melayu language and they are in. Zakir should have been kicked out of the country the moment Pakatan Harapan came to power. That he remains here – despite his fugitive status, his unsavoury background, his alleged links to terrorists, his taunting of religious minorities and his disgraceful support for the former regime – is just another indication of the misplaced priorities of Malaysia’s political elites. Whatever it is, it’s a sad day for Malaysia when Mujahid, a so-called reformist leader, someone we were all hoping would help moderate the trend towards religious extremism in our nation, draws inspiration from the likes of Zakir Naik. It really makes you wonder what lurks behind the reformist façade of some of these PH leaders.